When I heard Dannah Gresh giving all the reasons why she wrote her new book, Lies Girls Believe: And the Truth That Sets Them Free, I didn’t have to read all the disheartening statistics to know that what she said was true. I personally know a nine-year-old girl who seriously considered suicide; an eight-year-old who is stick-thin but obsessed over how many calories she consumes; tweens who have major anger management problems. And these are all girls from Christian families! And I’ve recently become aware that in my mid-sized Midwest city, it’s the “cool” thing for sixth-graders to identify as transgender. You don’t have to look far to see the lies our girls are believing—which makes my heart anxious for my own sweet eight-year-old. While my husband and I are doing our best to train and disciple her to follow Christ, I’m aware there’s an onslaught of lies beating at the door of her heart. We’re already trying to teach her how to combat those lies with God’s Truth, but I was excited to see Lies Girls Believe, written for girls aged eight to twelve, plus the accompanying Mom’s Guide. I hoped this study would be a valuable resource to help my daughter understand Truth in a new way. First of all, Lies Girls Believe is just fun to look at. When I showed my daughter the book, she was immediately attracted to the candy-covered apple on the cover (and wondered if we would be eating these as a part of our study!). When you open the pages, the inside design continues the theme. Filled with caricatures (including ones of Dannah and Nancy), bright colors, whimsical graphics, and age-appropriate quizzes and games, it’s perfect for tween girls. My own artsy daughter loved doodling, tracing, and coloring on the pages. As you go through the study, girls get to hear real-world struggles illustrated by the fictional character Zoey. As Zoey grapples with issues like social media usage, lying to her parents, dealing with mean girls, and more, your daughter will have a real-life look at the consequences for believing lies . . . and see the benefits of replacing them with Truth. Plus, there are sections for her to offer Zoey advice on how to handle these situations, giving you and her the perfect opportunity to talk more in depth. The book is designed for girls to go through it on their own first, and then sit down with their moms to discuss later. Since my daughter is on the lower end of the target age range, I found it worked best for us to read through each chapter together. We took turns reading aloud (she always wanted to read Zoey’s parts! ), and we talked through the questions and discussion points. She loved getting out her colored pencils to underline different parts of verses, and I appreciated how that part of the study helped her to look at Scripture in a deeper way. At the beginning of the book, Dannah included a Girl Drama Quiz, where girls were asked to circle sets of words that reflected how they felt most of the time. Unloved and unlovable. Sorta dumb. Calm, cool, and collected. Content with how I look. For those that were on the negative side (which directly related to a lie), Dannah used the term “sticky feelings”—a bad feeling you have; you don’t know why, and it just won’t go away. I already knew my daughter struggled with certain sticky feelings. However, I was surprised at how many she circled, which clued me in that there were a lot more lies embedded in her heart than I was aware of. We’ve only gone part-way through the study so far, but each time we get together, my daughter is pretty upfront about some of her struggles. For instance, I already knew she had a hard time submitting to authority, but it was refreshing to hear her admit it on her own, without any prompting from me. Plus, I’ve been able to take the Truth we’re learning and apply it to things that have happened at school, with her friends, and even in episodes of Adventures of Odyssey, which she listens to every night. The Mom’s Guide Is a Must! As much as I’ve loved Lies Girls Believe, you really need to have the accompanying Mom’s Guide to get the most out of it. 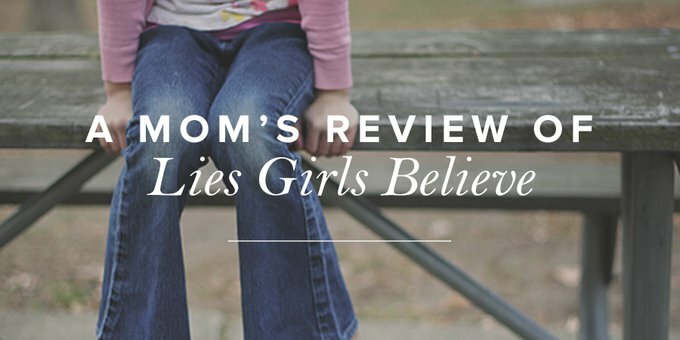 Dannah shares research, case studies of real-life girls and their moms, and practical tools and questions to help your daughter discover the lies she’s believing and replace them with God’s Truth. What I wasn’t expecting, however, were the things God revealed to me . . . both about myself and how I’ve been parenting my daughter. I appreciated the exhortation to avoid parenting from a place of fear. And I needed the reminder to both comfort and confront my daughter when she sins, just like God did with Adam and Eve in the Garden. But it was when Dannah talked about getting to the root of the problem that a light bulb went on in my head! My husband and I have been mostly addressing the spiritual weeds we see in my daughter’s life. When she displays sinful behavior, we’ve given consequences, talked about our expectations and God’s desire for her life, and prayed together. But now, I’m realizing we haven’t gotten to the root of the issue. And if I want my daughter to flourish, we need to help her yank out any lies by the root and in their place plant the seeds of God’s Truth. We are not looking for little t truth. We are looking for the invisible, but magnificent, powerful Truth of Jesus. Your daughter may be suffering from leukemia or depression. She may be the mean girl everyone’s afraid of or the target of one. She may struggle with every learning disability ever diagnosed or academic pride. She could be boy crazy or be experiencing a gender disorder. Maybe she’s simply unkind or unmotivated. Look beyond the little t truth and reach for the magnificent, powerful Truth of Jesus. PS: Head over to the Revive Our Hearts store today to pick up your copy of Lies Girls Believe and the Mom’s Guide! We’re sure your daughter (or another young girl in your life) will enjoy it as much as Mindy’s daughter did! And for more resources for your tween, head over to our friends at True Girl! We’re excited to be partnering with them in ministry to reach the next generation with Truth and hope.